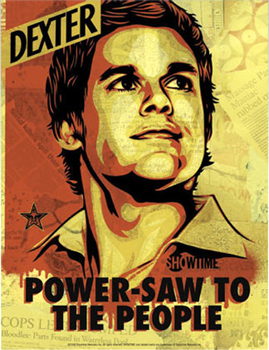 Grab this limited edition “Dexter” print by artist Shepard Fairey while supplies last! Only 100 pieces available! Collector’s artist-autographed print is inspired by Dexter Morgan, a thoroughly likeable blood spatter analyst for the Miami Police Department whose hobby just happens to be killing other killers. Silkscreen print measures 18” x 24”.